If you rely on Western media for insight into people’s deepest inclinations, you’re likely under the impression no one has ever been motivated by religion (not really) to do harm. If a man admits to killing his wife in a fit of jealousy, we are satisfied with the explanation. No one on the nightly news assures us jealousy could not have been his true motive, that there must be underlying causes which have absolutely nothing to do with his wife’s alleged infidelity. Yet when a man kills in the name of Islam, we insist socioeconomic inequality and oppression must be the root cause with religion the all-too-convenient scapegoat. He is simply expressing his real grievances, we tell ourselves, in religious terms. When well-meaning liberals fail to convince their opponents the doctrine of Jihad as expressed in the Qur’an, for example, has no causal connection to acts of violence in the real world, they grasp at another straw: if religion is to be held accountable for its crimes, then why not atheism? What about Stalin, Hitler (who was not an atheist), or Mao? These arguments have inspired the chart below, which outlines various reasons (according to the friends of religion) one might act well or poorly. Many would have you believe that Q1 is a regular occurrence. Look at all the good, they remind you, which is done in the name of religion. If you attempt to stack Q1 against Q3, they reply that Q3 is an oversimple, unsophisticated way to account for behavior. Human motivations are so complex, religion could never be the root cause. Religion is only used to justify actions, they say. I actually agree with religious apologists on Q2. There is no logical path from “I do not accept belief in any gods” to “therefore I will be kind to my neighbor.” If one does good in the name of atheism, it is to make the point that one does not need a god to do good, which is different than claiming to be motivated by the fact of atheism itself. I also agree with Q1, for that matter, which means, for those not keeping track, the whole top half of the chart looks fine to me. The bottom half is worse than false; it’s false and inconsistent with the top half. 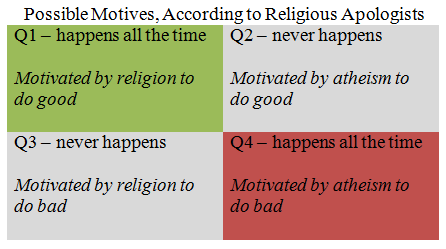 If there is a connection between religious beliefs and some good behaviors (i.e. I’d better tell the truth or Yahweh will be angry), and there seems little question there is, then why can’t the same be said of some bad behaviors. A disturbingly large portion of Islam advocates death as the penalty for apostasy. Nations under sharia law will reward Muslims who leave the faith with death. Are we to believe this would be the case absent religious motivation? Is anyone prepared to claim this punishment is only meted out to people whose accusers wish them dead for other, unrelated reasons? The argument that religion can and does motivate bad behavior is so easy to make, it gets boring fast. Moving onto Q4, I must again deny any reasonable path to “therefore, do evil” from “there are no gods.” Suppose I want to murder my neighbor. Can you imagine a world in which I desire his death because there are no gods and for no more relevant reason? I will grant that a belief in a god might discourage one from murdering him, but how could a lack of belief ever be the cause? It’s not even a coherent form of justification. “Why did you murder him?” Because he stole my property. “Why did you consider murder an appropriate response?” Because theism has not been justified to my satisfaction. Suppose, on the other hand, my neighbor is worshiping the wrong god, and I am under explicit orders to have him killed (Deut 13:8). There is a clear and rational path from my devotion to religious doctrine and my murderous act. Were this reported in the news today, reporters would scour sources for ulterior motives and, in their absence, assure viewers this was not a religiously motivated attack, but the act of a deranged extremist. As though the two were mutually exclusive. My argument is simple: beliefs inform behaviors. We can often take people at their word when they attribute their actions to certain beliefs. When a Christian tells me he has nothing against homosexuality personally but opposes gay marriage on account of his religion, how presumptuous would it be to insist he is a bigot, that religion itself could never account for his stance on the matter? Likewise, when a man attributes a charitable act to his desire to please his deity, who are we to contradict him? To my hairsplitting friends: Yes, our stated and unconscious motivations are often out of step. Human beings are immensely complicated. Let us by all means enjoy a dialogue on the various factors which bear on behavior. This dialogue should not begin by declaring, “human behavior is complex, therefore religion does not motivate bad behavior,” and if it does, the same should be said of religion and good behavior. If we insist on being wrong, the least we can be is consistent. Having said that, I do appreciate the need for caution on this issue. We ought to be sensitive to racist depictions of Middle Easterners and sweeping generalizations about Muslims. We cannot, if we wish to address religious crises directly and effectively, ignore the real connection between religious doctrines on women, Jihad, etc., and the way people behave. Ideas inform behaviors, and to deny this is to plant one’s fingers firmly into one’s ears, a posture which makes (and has made) productive conversation all but impossible.